A recently released survey commissioned by Mylan Specialty revealed that as many as one in three parents report that their children with life-threatening allergies have experienced anaphylaxis on Valentine’s Day. Remind your child never to eat food that has not previously been approved by their parent or caregiver, and if prescribed, be sure to carry an epinephrine auto-injector at all times. Remember to read the labels, every time – seasonal products may have different ingredient formulations. More tips are available on FARE's website. Thankfully (tee hee) the traditional Thanksgiving meal can be adapted to accommodate a variety of allergens. Nut allergy? Make a nut-free dressing and offer desserts other than pecan or mince pie. Dairy allergy? Substitute dairy-free butter, dairy-free whipped cream, etc. (Cub Foods in East Brainerd regularly carries RichWhip, a dairy-free alternative to Cool Whip and found in the same freezer section.) Wheat allergy? Try a wild rice dressing instead of bread or croutons. Egg allergy? Instead of pumpkin pie, offer pumpkin bread, bars, or rolls, using egg substitute as needed. 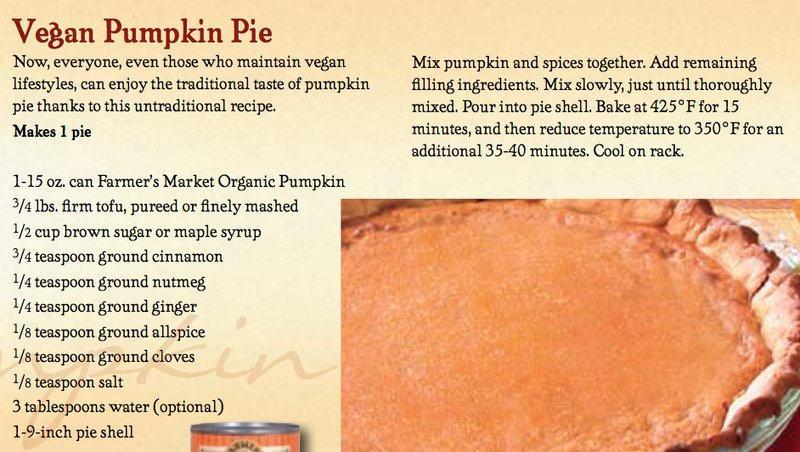 Or try the attached vegan version! Other recipe ideas can be found at Eating with Food Allergies. With so much allergen-containing candy around, Halloween can be a challenging time for kids with food allergies. Here are some of our tips for making Halloween safe AND fun! 1. Be vigilant about label reading. Many manufacturers change plants when making special holiday candy, and different varieties of candy can have different ingredients. Examples: Full-size Hershey bars do not contain nuts, but bite-size Hershey products typically DO contain nuts or nut warnings. Chewy Runts and SweetTarts contain egg, but their crunchy counterparts do not. 2. When your child comes home from trick-or-treating, you can either swap out the entire bag for another bag that you've pre-prepared with "safe" treats/prizes, or go through each piece of candy individually and separate the safe from the unsafe. 3. Unsafe candy can be donated, traded with siblings, or set out in a designated spot for the "Good Witch" who comes during the night, takes the unsafe stash away and leaves a gift in its place! 4. If you don't know for sure what's in a treat... Don't Eat It! Check out FARE's Halloween Tips and KFA's Halloween Tips for more ideas!